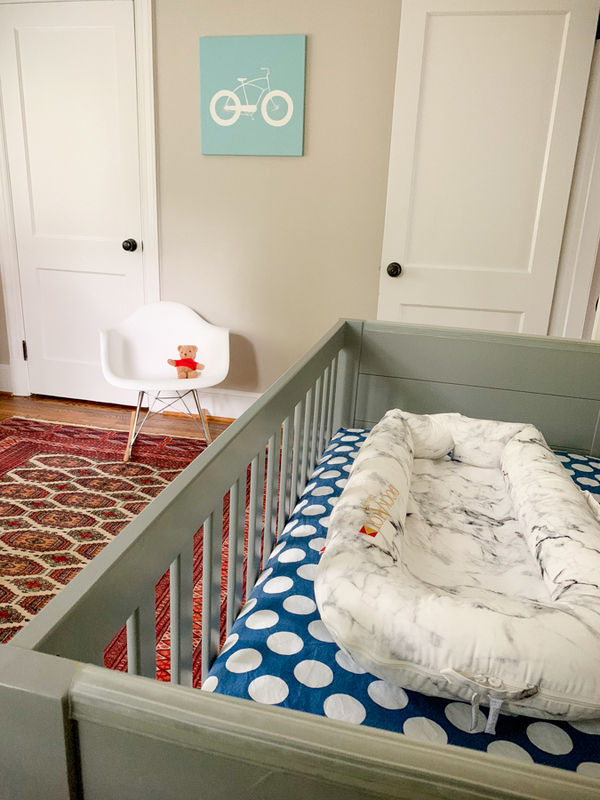 You are here: Home / Baby#2 / Baby B’s Nursery! 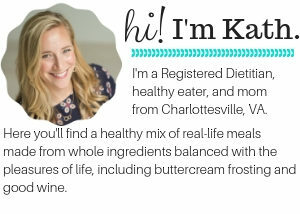 I love when bloggers are real! 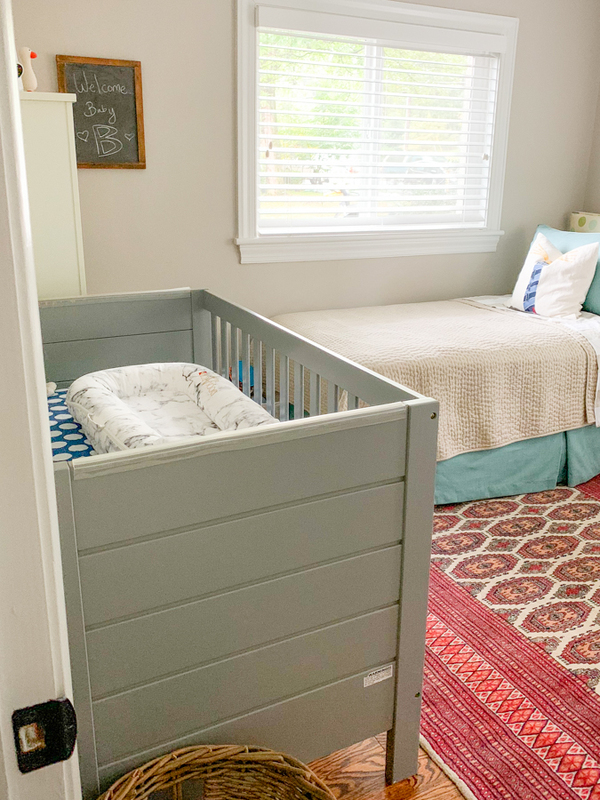 A beautiful yet simple space for the baby! Love it! You’ve inspired me to tidy up this weekend ha! Its perfect! Thanks for sharing even though you don’t think it’s “Pinterest worthy”. Looks great to me! 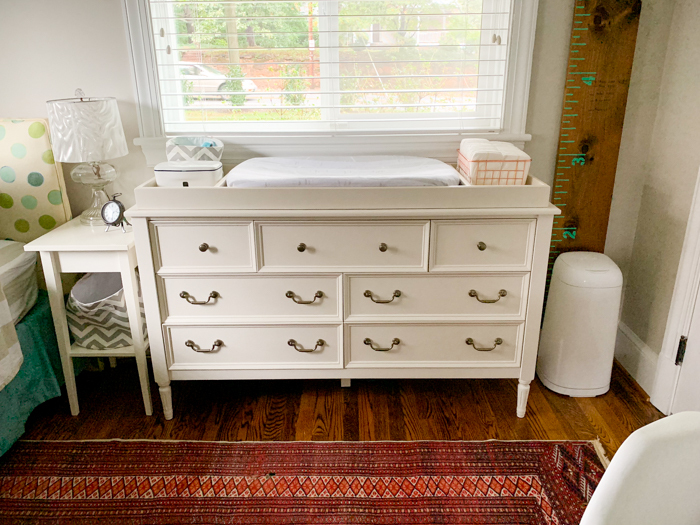 I didn’t even have a nursery decorated before my baby was born … lol. My mother in law picked up a few things after she was born and that was it! Then she didn’t see the inside of her crib for ten months ….. lol. We had a twin in both our boys’ rooms and they have stayed. I actually spent the night there many, many times and still do if he is sick even though my baby is 10 and also had a double bed in there. Looks great! 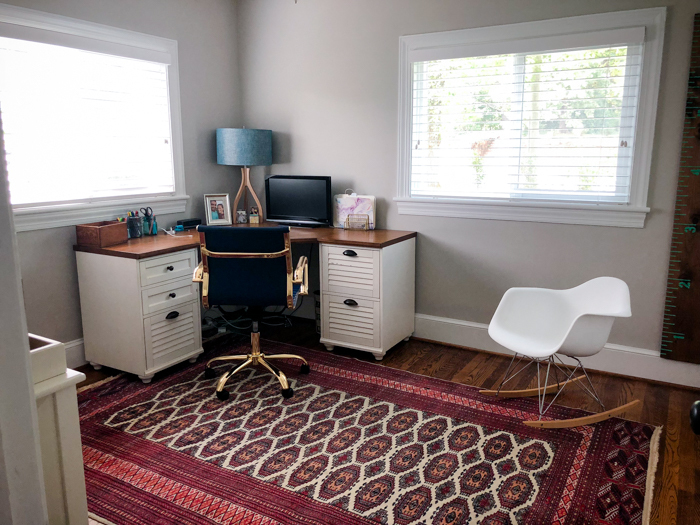 How is this NOT a photo worthy nursery?? 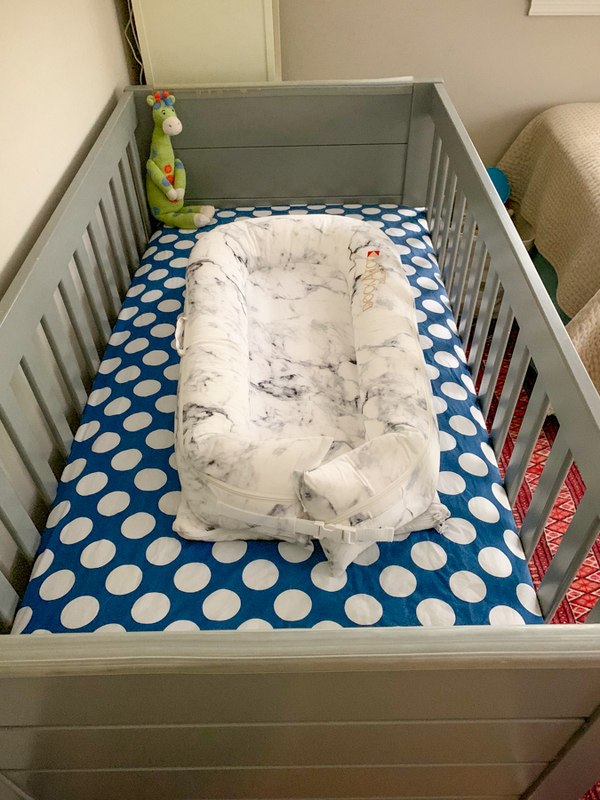 I think it’s absolutely lovely & you can certain tell the care you’ve put into giving the little guy a cozy and sweet space 🙂 Would never have guessed that is a Wal-Mart crib! I love it. It looks amazing and REAL and usable. 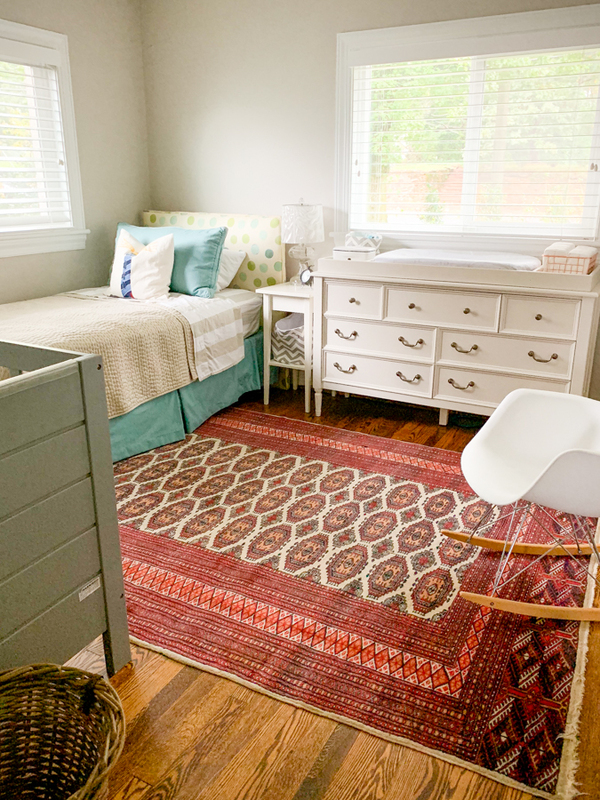 Your nursery is seriously beautiful! I love how you are able to change up your space so effortlessly, or at least it looks effortless. You have such an eye! My baby who is now 7 months old has the exact same rocker in his room so I did all the nighttime nursing in it. I put a thick blanket hanging over the back of the rocker and it cushions the back where you lean against it and makes it MUCH more comfortable! I just happened to throw a blanket my mom had knit over the back and the next time I sat it in it, realized how much more comfortable it was so I thought I would pass along! 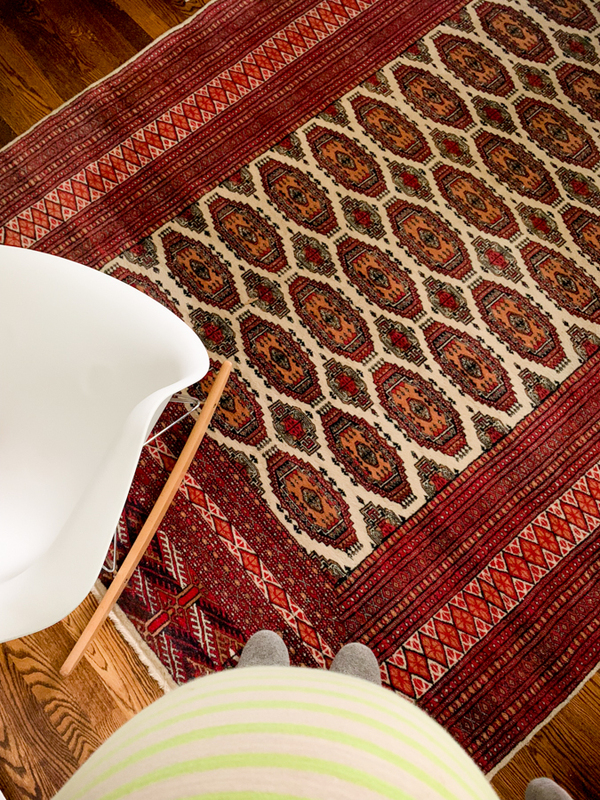 Such a great little rocker – small and gets the job done without taking up tons of space. Thank you! I think it’s lrett comfy as is so I bet a blanket is perfect! I don’t think it looks crowded at all. 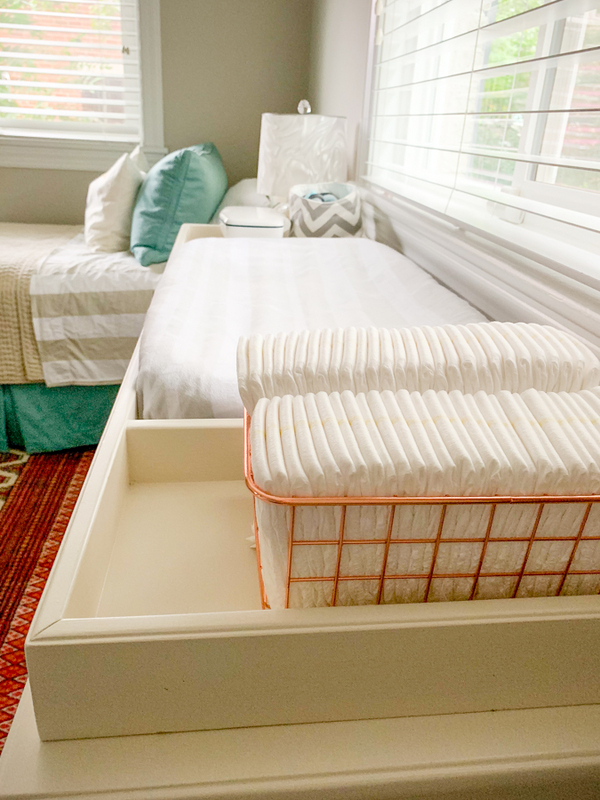 But then, I had a full size bed and a La-Z-Boy recliner crammed in my baby’s room the first year so I guess it’s all relative. Haha! 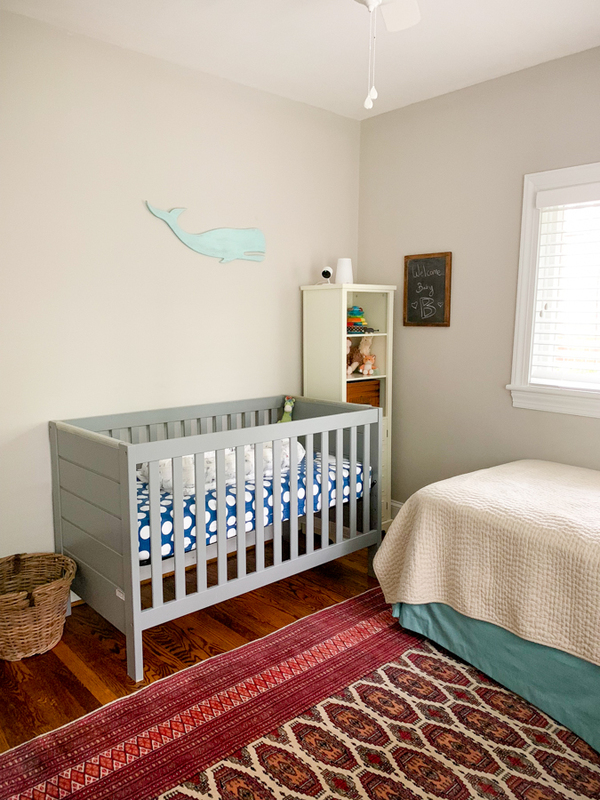 I LOVE your nursery and think it is very photo worthy! 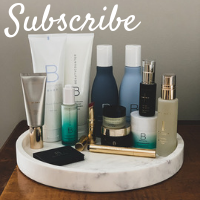 You have blended everything beautifully, and I really love your refreshing necessities/practicality versus Pinterest and fluff. 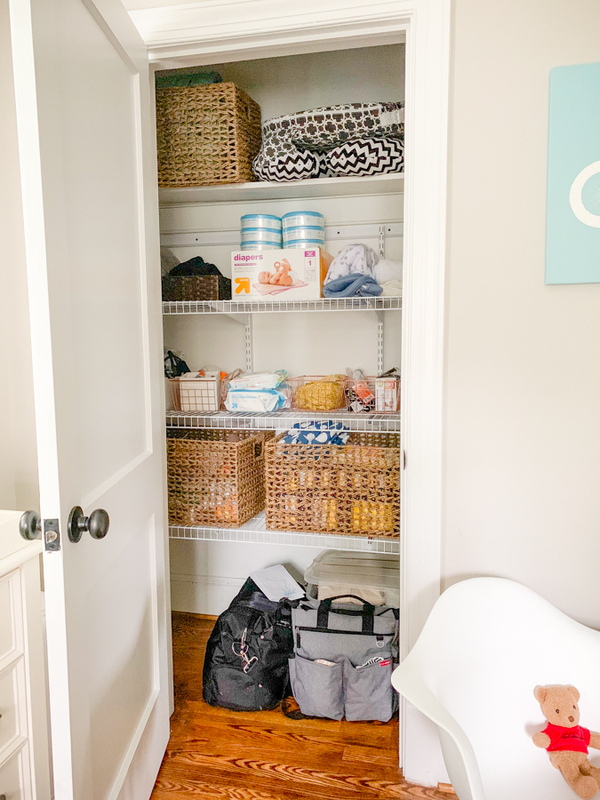 All your decor and storage seems well-thought out and the room layout seems really nice. It’s such a sunny, cheerful nursery! I hope you don’t have to wait too much longer for Baby B. How did you make the bicycle painting? Is it a stencil? Would love to know what diapers you are using! Love the all white ones! These are just some target brand newborn ones! The nursery looks absolutely beautiful! I love the way it is coordinated and how comfortable it looks. I love it! I went a little insane in our nursery and now I’m like why??? Why did I do that? Lol and the one thing I had the hardest time with was getting rid of the Queen bed. I think maybe keeping a twin size bed would have been a nice compromise since we do have a lot of out of town family. Baby will sleep with us too for who knows how long but it’s still nice to store stuff there!! 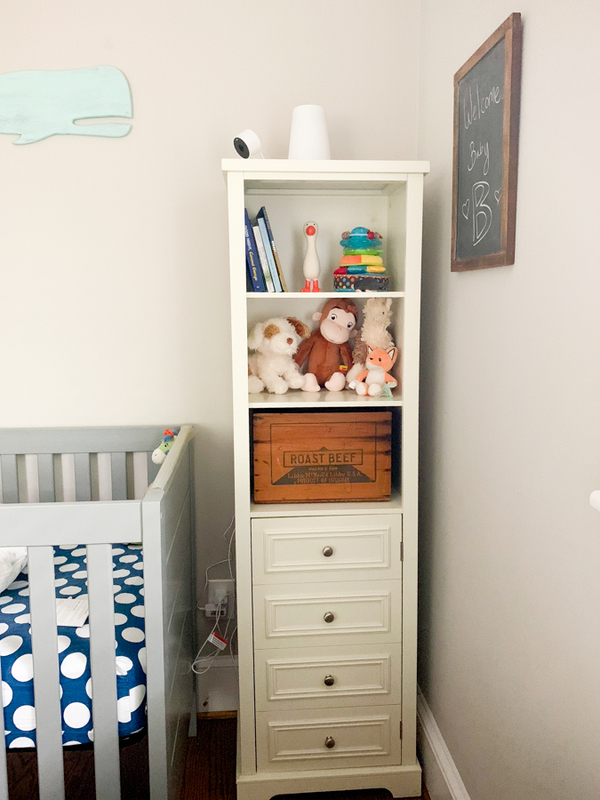 I love your nursery and I think it’s pinterest worthy! I love that you are reusing things. We live in such a disposable world. I love seeing Mazen’s crib and rocker again! I absolutely love it! I think it’s wonderful you are reusing things. Babies spend such little time in nurseries usually and don’t care about what it looks like. I think what you have done is beautiful. I can’t wait to hear the news of his birth. I think you’re going to be surprised at how fast and less painful your second birth will be! Love it! We have a bed in our little guy’s room, too. I have spent many a night in there sleeping near him, with him, nursing him, playing on, etc. It’s crowded in his room, too, but it makes so much sense to have a bed in there. Sometimes my 4 yo daughter likes to sleep in there, too! I agree with Thomas, that rug is beautiful! It’s only appropriate for the boys to share a crib, teeth marks and all? ?